When Book Club Girl, a site “dedicated to sharing great books, news and tips with book club girls everywhere,” asked me to write a guest post, I knew exactly what I wanted to talk about. For over a decade I’ve belonged to a wonderful group of book lovers in Montclair, NJ, where I live, and several years ago I became part of very different reading group of writers in New York. As I write in the post, “My two book clubs serve entirely different purposes. The Montclair group provides a way to stay in touch with a circle of friends and read current books … And the writers’ group is equivalent to a welders’ convention – a place to exchange ideas about our trade.” And they’re equally useful to me as a writer and reader. You can read the rest of the post here. 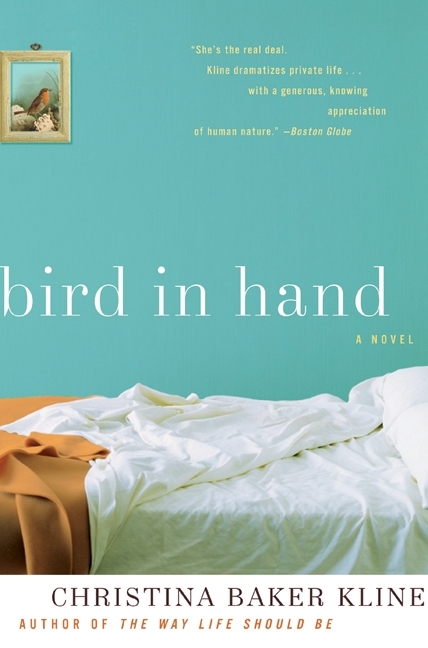 Baristanet, a “hyperlocal” citizen-journalism blog in northern New Jersey run by veteran journalists Debbie Galant and Liz George, featured a piece this week on the original inspiration for Bird in Hand, which used to be called Four Way Stop. When my husband and I moved to Montclair after years of living on the Upper West Side, one of our first purchases was a minivan. I hadn’t driven in years, much less an unwieldy, seven-seat bus, and I was filled with anxiety. Traffic can be fast and unforgiving; caught in the maze of unfamiliar roads, I was constantly losing my bearings. My children’s lives were in my hands – my white-knuckled hands, that is, gripping the steering wheel. This quiet terror propelled me into writing my new novel, which was called, until recently, Four Way Stop. Four-way stops had always struck me as quaint, something you might find out in farm country, but I began to see them all over the place in New Jersey. (In fact, Montclair recently installed them near many schools.) As traffic situations go, they strike me as oddly ambiguous: they require not only manners and mutual respect to work as they must, but a basic knowledge of the rules. What happens when someone doesn’t understand – or follow – the rules? In my novel the central character, Alison, gets into an accident at a four-way stop in which a child dies. This accident changes the (interconnected) lives of four people. Somewhere along the way I realized that I was writing this book as a way of exploring my deepest fears around this subject – and that those fears were too close. I put the manuscript in a drawer and only came back to it after several years, when my children were older and my worries had subsided. (For one thing, I’d become a fairly competent driver.) And I broadened the scope of the novel: the accident became a catalyst for the larger story rather than the story itself. 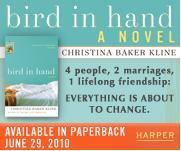 As the book took shape, I replaced the title with one that better fit the emerging story: Bird in Hand. I’d come to terms with the four-way stop. It was time to move on.